ghost meringue | what is clara eating today? the texture is more marshmallowy than crunchy meringue cookies. Whip egg whites with a mixer for about 30 seconds. Add cream of tartar and salt and whip until soft peaks form. Add Truvia and lemon juice(or vanilla flavor) and whip until stiff peaks form. Spoon in the mixture into a ziploc bag and cup out one corner. 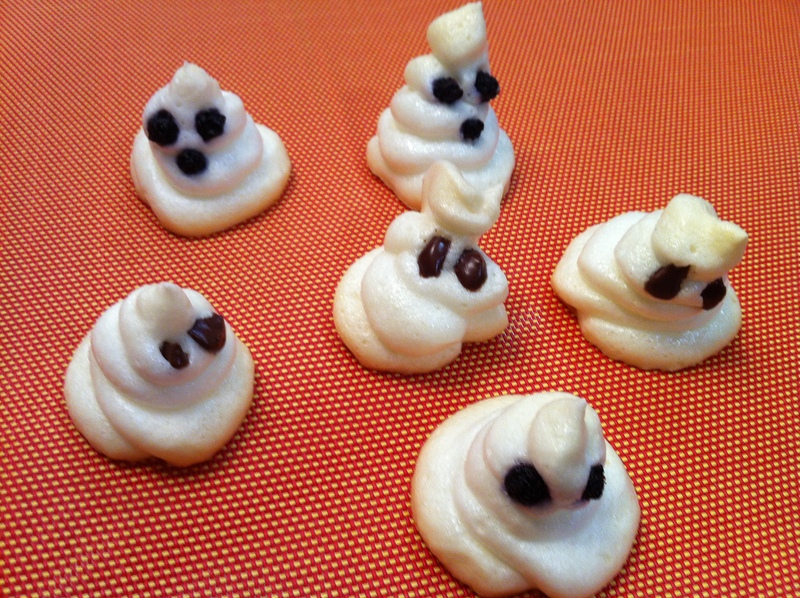 On a parchment lined baking sheet, pipe out the meringue into ghost shapes. insert chocolate chips as eyes. bake at 200F for 1.5hrs. let them cool in the oven for 2-3 hours.